As part of my resolution to eat healthier, I'm cooking a lot more at home. My favorite time to cook is during the weekend, when I can have a couple big projects going in the kitchen. Friday night or Saturday morning (especially when I am in CT and have a HUGE kitchen at my disposal) I will peruse the sale circular for the local grocery chain....When I don't have a specific recipe in mind to make, the sales can usually help me to make a decision. 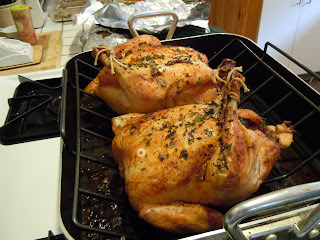 This week roasting chickens were .99/lb! I decided to roast one for myself and one for Rafe. This Sunday was perfectly cool, with just enough fall in the air to turn on the oven for an extended period of time. This week I plan to use the chicken for a couple of dinners, and also in sandwiches and salads as well as my lunches for work. Monday I made a salad similar to last week's....subbing in chicken and some diced apples. For Wednesday I'm thinking I'll make a sandwich with some of the shredded chicken and some BBQ sauce, and some leftover roasted sweet potato....or maybe some spicy honey mustard, brie cheese, and apples! Set the oven to 350. I start by removing the chicken from its plastic, and pull all of the bags out of the cavity (neck, etc). I give the little bird a rinse, pat him dry and sit him comfortably in the rack of a large roasting pan. 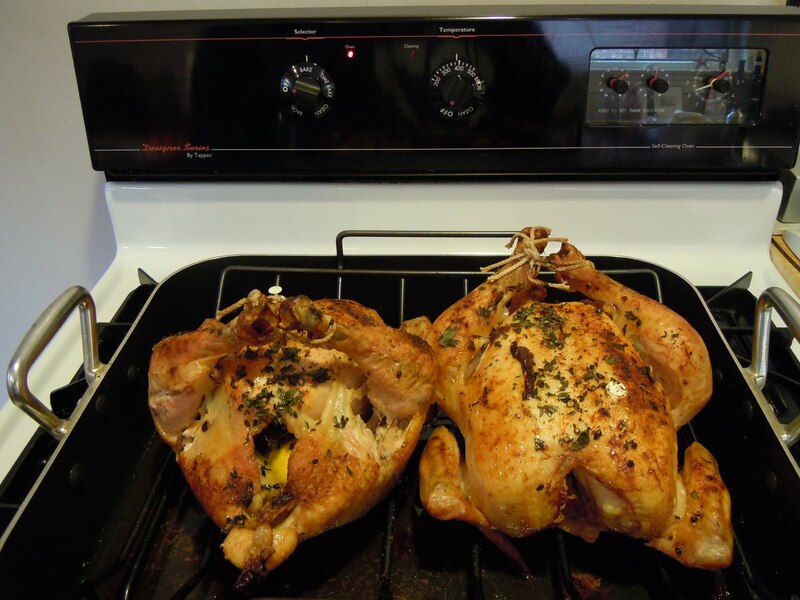 I salt and pepper the entire bird (inside and out). Then I get to work stuffing delicious aromatics into the cavity: the onion, lemon, cloves of garlic and sprigs of parsley and thyme. I finish the chicken off with a sprinkle of paprika (all over the chicken), and the chopped herbs. Then I bend the wing-tips underneath the chicken breasts so they don't burn, and tie the legs together with some twine to promote even cooking. 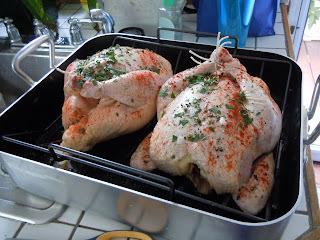 Now the bird goes into the oven.....350 degrees, 20 mins per pound of chicken. I like to add another 10 minutes at the end, at 450 degrees to get a nice, brown crispy skin. Use a meat thermometer to check the doneness of your meat - it should be at 180 degrees to be completely done. If you don't have a thermometer use a knife and poke the chicken at its thickest point. I usually do this on the thigh, right under the drumstick. If the juices run out clear, and the drumsticks feel loose when you jiggle them, then you're good to go...if they're still tight and the juice is pink, put it back in the oven for a little longer. Depending on how done it is I usually peek in on it in 10 minute increments beyond the cooking time just to make sure I don't overcook it. Nobody likes dry chicken! I love roasting chickens. My favorite way is stuffing them with herbs and lemons. Yum! 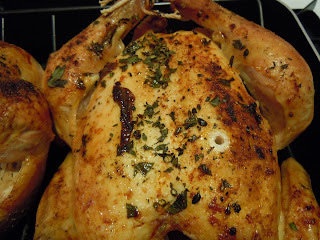 Once the weather gets a little colder, I love throwing a roasting chicken in the crockpot for some tender chicken for a myriad of dishes!